Working on a one owner 1921 T for a friend that I believe to be nearly all original largely unmolested car. Rebuilding steering column. Car is 4:1 pre-pin stop; gear case had no groove. Mystery is the Pitman arm keyway on shaft is oriented about 25 degrees out of position CCW relative to where it should be if the opposing gear pin is to align to top dead center assuming I decided to a slot and long pin to make it operate as a late 21 early 22 with the safety stop. No evidence of a twisted (over torsioned) shaft. Has anyone seen this condition before, or did one of Henry's finest make a manufacturing error that was never caught because it never had a safety pin? First off with 30 inch wheels I have never had an issue with going over center on my 1921. The pre pin and slot, there is no need to have anything aligned. It is dropped in and rest of parts assembled. If you are going to add pin and slot maybe look for 4:1 shaft that is already set up for it. During my initial evaluation, I was able to over center while parked. It is 30 x 3 wheels. The rest of the front axle is relatively tight so unless the drag link is incorrect, something else is amiss. I did also notice that when the wheels are centered pitman is slightly to right of vertical (viewed from front). google mtfca; drag link and compare to what is on the car. Chris, with no long pin and slot to take into account, the shaft and planetary gears can be inserted in any position. With the wheels centred, it may be possible to take off the planetary gears and rotate the shaft so the keyway is central, and the gears can be replaced one tooth further around. But it means nothing. Without the pitman arm installed the wheel is free to rotate all the way around in any direction. If your wheels are centred, and the pitman arm is vertical, the drag link needs to meet. Too short or too long will result in turning further on one side than the other. There is a practical reason to time the planetary gears and steering wheel gear on Canadian cars. Because the horn button is on the steering wheel nut, there is a loop in the two wires to the horn. With the wheels straight ahead it is best to have the steering wheel spokes at 4.30, 7.30, 10.30 and 1.30 with the wires in the lowest quadrant. That way the wires will be rotated the same amount either way you turn, rather than wrap more tightly one way than the other. 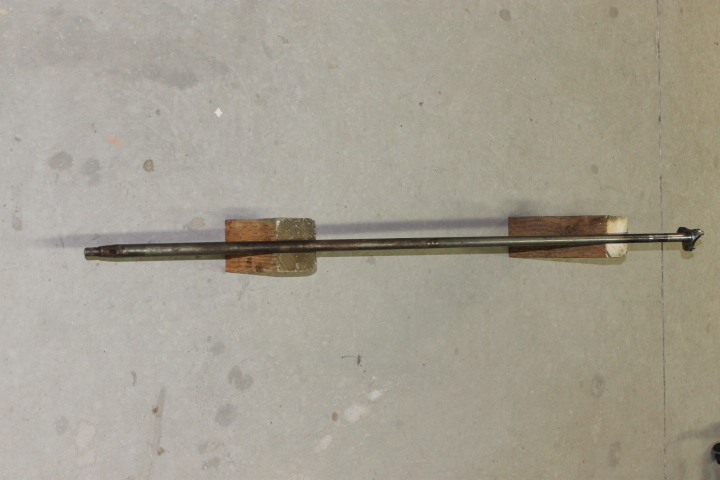 7-29-12 Riveted rod adopted. Brazing pin holes at various angles. 11-4-12 Pin holes now drilled in the same direction. 1-9-14 Both ends of brazing pins riveted over. 7-14-16 Ford design with forged end adopted. Earlier type continued in use (supplied by outside firms). 5-8-17 Ford design now used exclusively. 10-2-17 Length changed to 30.938�31.062�. At the introduction of and for the 1926 models, the length was 31.125�31.250�. 10-7-25 Length changed to 30.812�30.875. I would pull the drag link or as Ford called it the Steering Connecting Rod off, with the wheels straight ahead and pitman arm pointing straight down check the center to center between the two balls. You should be close to 5-19-19 length. Also check your toe in, that could make a small difference. The more toe in the longer the length between the balls where the drag link mounts. Will not be a lot but there will be some. If you are looking at it from the front and the pitman is too the driver side with the wheels pointed ahead, then the drag link is the wrong one or something else is out of alignment. Check to see if the spring is centered in the cross member. Or the pitman arm is the wrong one, but lets start with the drag link. 30X3 wheels have the same outside diameter as 3X3.5, sidewall just not as high. 30 x 3 wheels have a 24" diameter - 30 x 3 & 1/2 have a 23" diameter. Steve that is the diameter of the wheel itself not the outer diameter of the tire. Steve, The measurements you state are the dimension of the rim and inside diameter of the tire. Correct 30x3 & 30x3+1/2 tires are the same outside diameter.